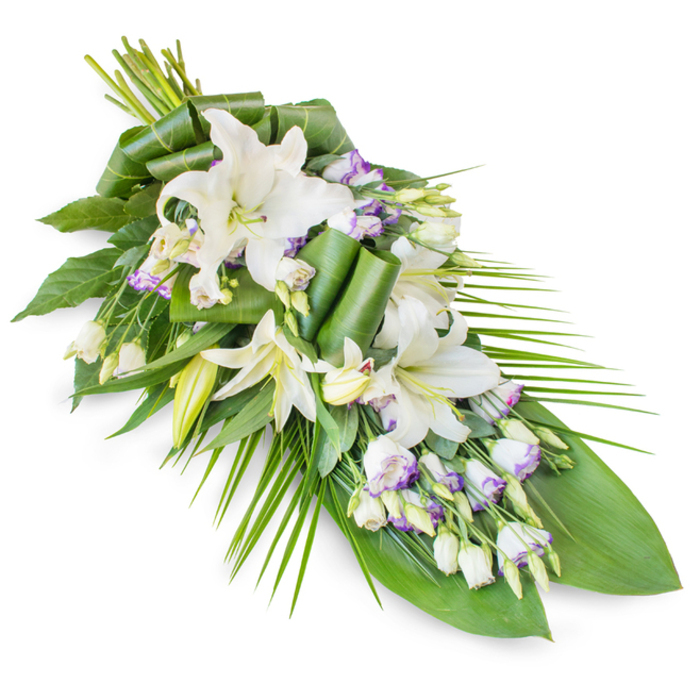 Classic white liliums are complemented by aspidistra leaves and lisianthus to create this contemporary spray. It is a perfect way to honor your great loss. Thank you sincerely for the timely delivery. Gorgeous flowers. The family really liked them. Thanks. The spray was just perfect. I wish I didn't have to order flowers for a funeral but this is life...I hope the next time I order flowers from this florist would be for a happy occasion. The delivery was made trouble-free and all the funeral flowers were in place. Thank you. Very delicate spray consisting of fresh and beautiful flowers. Thank you for the safe delivery and your very kind attitude. Liked the combination of flowers. It's very delicate. The Handy Flowers team took my order on the phone and arranged the delivery of the flowers. It was easy and convenient for me. Found the service very efficient. The team were very responsive to my needs and arranged the most beautiful flowers. Great company! It was hard to choose flowers for a funeral of a loved family member, but I made the right decision when ordering with Handy Flowers. The customer service was just amazing and the flowers were delivered on the day of the funeral, couple of hours earlier as promised.